Beginning September 30th of this year, Russian airstrikes and heavy support to the Syrian government have been the cause of significant study and reporting. While the immediate effects can be seen from gun camera footage, videos released from groups hit, and trying to extract the truth from the exaggerations by government sources, what is unclear is what the long term effects of these strikes are. And perhaps more importantly, in determining if they will be forceful enough to persuade outside backers of the Syrian opposition that it’s pointless to continue. What can be seen from the past month however, is that the provision of heavy weaponry to the Syrian opposition has not only failed to lessen but has in fact significantly increased. The writing is on the wall that Russian intervention has not forced supporters of the Syrian opposition to scale back their support out of fear of further expanding the proxy war raging in Syria, but have instead met the threat head on with greater levels of support and promises of future support. Over a month after the Russian intervention in Syria began in earnest first and second order effects of that intervention are beginning to be seen. While the battlefield has not drastically changed for the better (or worse) for any specific actor, marginal gains are being by made Syrian government forces in Aleppo and Latakia in the north, Daraa and potentially Quneitirah in the south, with a see-sawing effect in Hama and Homs as victories in one are are traded for losses elsewhere. The doomsday fate predictions of the Syrian military have significantly thawed and the near unstoppable tidal wave of Jaish al-Fateh offensives in northern Syria seems to have cooled off if not stalled out. Whether Russian intervention is going to be key to a Syrian government victory or a better final outcome for the government remains to be seen, but measurable effects on the ground in terms of land captured, enemy leaders killed, and infrastructure destroyed or disrupted can certainly be measured. More importantly it is being measured and is the focus of quite a few articles discussing the effects of Russian intervention. But what isn’t being spoken about is the tremendous increase in opposition anti-tank guided missile (ATGM) attacks on Syrian armor that seems to go hand in hand with the increase in Russian aid and support. Almost immediately after Russian intervention began the greatest usage of ATGMs since the conflict’s start began to be seen with a tremendous effect on initial Syrian military advances. Russian Mi-24 Hind conducting rocket strikes in the Aleppo countryside. Youtube. The ATGM has already established itself as one of the most significant weapons of the war, likely to be remembered with reference to the Syrian conflict the way the Soviet Mi-24 Hind was in Afghanistan, or perhaps more appropriately, as the Stinger missile systems that destroyed the iconic Hind. There is a tremendous cache of writing on ATGMs and their proliferation in Syria, but less is written about their impact. 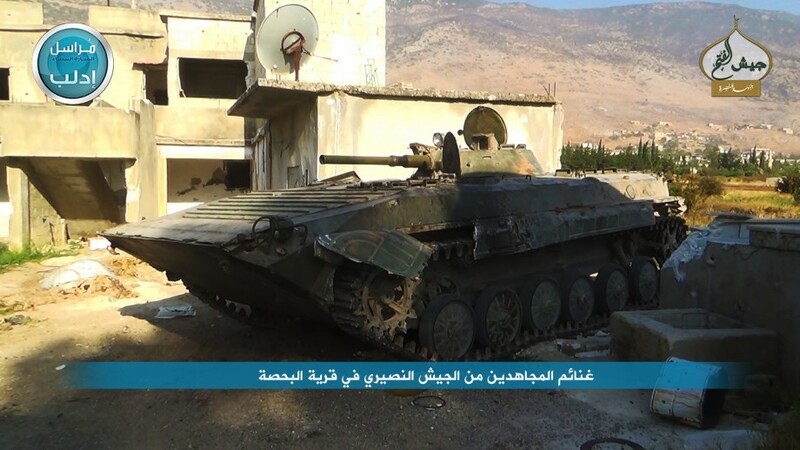 The Syrian military was the most tank heavy military in the Middle East pre-war, ranking sixth overall in the world with a staggering 4,500 – 5,000 tanks (although it has since been reasonably accepted that the working number of those tanks was significantly lower with many mothballed or out of service). The tanks purchased with the vision of pouring over the Golan Heights into Israel, or conversely defending the Syrian border from Israel assault were likely never envisioned to be deployed in nearly five year long civil war against an opposition force that was beginning to reach parity with Syrian military. The natural reaction of forces faced with tremendous armored strength is to either gain armored strength themselves, something increasingly common as more and more opposition groups capture tanks and armored vehicles, or to acquire means to defeat armor. 1st Coastal Division gunner fires a TOW missiles at a Syrian tank. Youtube. The proliferation of ATGM systems in Syria is among the most prolific in the world with at least ten different missile systems in in widespread use and several others in less frequent use, with several thousand missiles of all types spread throughout the country, via capture of Syrian military stocks, black market, transfer from Iraqi stores captured by ISIL forces, and the supply of regional supporters of the Syrian opposition including the Saudi funded TOW programs in Jordan and Turkey. 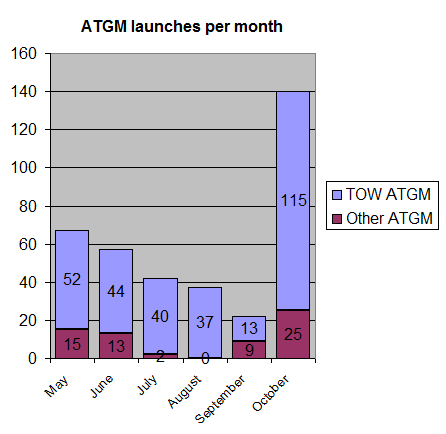 The TOW program’s success in 2014 and 2015 has been so widespread that the TOW itself has come to be the most widely known ATGM missile system in Syria and certainly accounts for the greatest number of strikes that make their way to YouTube (which is in keeping with what we know about the relatively secretive TOW program). Large number of ATGM missiles captured in bunkers like this one near Damascus in 2013. Liveleak. So what are the numbers? In October, through studious record keeping both on the reddit Syrian Civil War platform, and even more long term recording and analysis by twitter user @yarinah1 there were 140 recorded ATGM strikes on Syrian military vehicles and positions. No doubt more were launched and not recorded but this is the data that can be independently confirmed as having occurred within Syria during the month of October. That data corresponds most heavily to the days of greatest offensive moves by the Syrian military against opposition forces in Aleppo and Hama governorates, where entire armored columns were stalled out as multiple missiles were fired from the same firing point and no visible action was taken to neutralize the ATGMs. A lack of communication and close cooperation between Russian air power and Syrian military ground forces (touched upon here ) meant that after initial strikes went unretaliated against, opposition ATGM gunners could continue to strike fresh targets at will, and much of the video evidence in the first half of October suggests that this is precisely what happened. In and of itself, 140 ATGM strikes might not mean anything to the casual observer. Thanks to the research and data plotting of @yarinah1, the past six months of ATGM strike data can be observed and gives us a general idea of ATGM strike behavior in Syria. Previous analyses of strikes in months and years past gives even lower numbers as monthly averages for strikes. So given the data, we see that at the previous month with the highest number of ATGM strikes in Syria, 67 were fired. Occurring primarily in northern Syria, during the Hama and Idlib offensives launched by Jaish al-Fateh, the number of strikes utterly astonished many observers of the conflict as groups reached a crescendo of offensive coordination that places ATGM teams among the most effective actors in those offensives. 67 strikes being the previous high would come to be more than doubled during the first month of Russian intervention and some of the heaviest offensive activity against opposition groups in the north of the entire war. This shows us that despite tremendous aerial bombardment by both the Syrian and Russian air forces in conjunction with heavy Syrian military offensives, missile proliferation was not only continuing but actually increasing. So how is it happening? Saudi officials reported in mid October that an additional 500 TOW missiles had been delivered to elements of the Free Syrian Army, which reduces the need to be quite as frugal with targeting and allows for a greater number of shots to be taken without fear of depleting supplies. Similarly, information has come out that the Friends of Syria alliance has been supplying Russian Fagot ATGM missiles and launchers to FSA units and providing training for them (Google Translate link), in addition to large quantities of Fagot missiles captured during earlier campaigns but unusable due to a lack of compatible launchers. 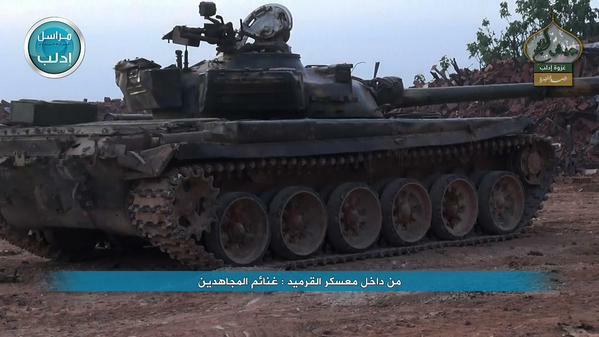 TOW strike on a tank immediately followed by a Fagot missile strike on a truck in the same location. YouTube. The influx of missiles and launchers may have pre-planned and only coincidentally aligned with the Russian intervention, but such events seem unlikely. Given the recent re-emphasis of the US government to provide $100m in support to Syrian opposition groups it appears that the principal supporters of the Syrian opposition are quietly doubling down on their weapon support to groups inside Syria. This helps to ensure that Russian airstrikes do not offer the qualitative advantage necessary to decisively alter the course of the war in favor of the Syrian government and provides the undertone that despite Russian involvement, outside support remains a priority to the Syrian opposition. Despite the clear impact of heavy involvement by Russian airpower, the uptick in heavy weaponry necessary to keep the ground forces at bay speaks volumes about attitudes towards continued support of the opposition in Syria. At double the rate of ATGM strikes of the next highest month of the war, October has demonstrated that the supply of heavy weaponry to Syria will not only not diminish, but grow to meet the evolving threat environment. Actions like these lend further credence to the idea that heavier weaponry will be supplied or that perhaps the rumors of limited delivery of anti-aircraft MANPADS to Syria. Time will tell, but October has been an illuminating month amidst rumors of Syrian opposition supporters backing off of outright weapons support and the Syrian military is certainly feeling the effects as their advances on the ground are met with ferocious hails of anti-tank weaponry. Forget “threaten Latakia” (above), they just actually hit it moments ago with rockets landing on Tishreen University. Big columns of black smoke. Casualty figures so far are 10 killed, 49 wounded – these will surely rise. They were almost certainly aiming for the army base adjacent to Tishreen University to the east. Let’s not forget that the past month has seen the largest Syrian offensive in a long time. Given the nature of the weapon. TOWs are more suited to defensive operations. And given the success they’ve had especially against the “moderate” rebels (but ISIS also) it makes sense that the rebels would have used everything they have in a desperate attempt to stop the SAA. It now appears that this attempt has failed. Al-Hadr has fallen, and the Syrian Army, without breaking stride has take Al-Eis, while simultaneously not only deblockaing Kweiris, but also pushing east to expand the lifeline to the base. Clearly the influx of Iranian arms and yes troops, as well as Russian air and artillery (yes there are Russian artillery units in the field) has made a significant impact. This doesn’t mean the foreign backers will pull the plug. Especially in the case of the Saudis who are just as happy backing ISIS as they are backing the moderates (maybe more-so with ISIS). But to suggest that Russian airstrikes are main, nevermind sole, reason for the spike in launches is just bad reasoning.